If you, like millions of other across the United States and Canada, are looking forward to escaping the harsh winter weather, or just trying to squeeze in one last trip while the kids are still out of school, you may be searching online for some getaway deals for a quick reprieve down here in the Sunshine State or to a nearby beach. It’s no secret that Florida attracts well over 100 million travelers every year, and many of them are already well-seasoned timeshare owners or vacation club members. Maybe you have even considered attending a brief tour to get a good deal or maybe some free attraction passes in the past and just decided not to. You may be scared off hearing the word “timeshare”, but things have changed drastically over the past decade. Gone are the days of high-pressure sales tactics where two hours turns into six hours or half a day and you’re forced into something you don’t want to do. The point of buying into a timeshare or vacation club promotion is just to provide you with an easy way to travel the way you want to travel and save lots of money doing it, but if you’re not in the market, that’s okay, too. For timeshare promotions with a tour, the hosting resort providing the initial deal is confident that even if you do not join the club, maybe you’ll visit again in the future and recommend it to your friends and family. Also, the recent rise of social media outlets, like Twitter (@StayPromo), YouTube, and Facebook (StayPromo Facebook), has created a great way to get the word out about these properties and their pretty sure you’ll enjoy it enough to at least mention it to your friends and followers on one or more of those platforms and that helps spread the word. It’s just a great advertising investment for the property, and all they had to do was discount their rooms for you to come visit. Definitely a win-win. Either way, if you haven’t thought about it much or even if you have, here are a few reasons why booking getaway deals with a timeshare or vacation club promo may be a good idea. When you consider the average cost of vacationing you know that the prices can add up quickly when considering everything you will need and want while traveling. The lodging, area attractions, dining, and shopping must all be considered, too. The average cost of a vacation to Orlando is around $200 per person per day, so a family of four can easily rack up over $3000 for just a short trip to Orlando, and that’s currently. Hotels on average, if you want to stay anywhere decent, will charge $150+ per night and the theme parks all charge at least $100, and Disney World AND Universal Studios, and a few other popular attractions, just raised their ticket prices (again). However, with a vacation club membership, your lodging, which accounts for anywhere between $600 to $1000 of your vacation expenditures, would already be booked and covered for your trip. Sometimes you want to plan a trip on short notice and sometimes you are able to set it up months in advance. If it’s short notice, and around any type of holiday or special event, you may find it difficult to get a room. Either the rates are astronomical or it’s simply not available. Usually, with a timeshare or vacation club promo, you have access to priority reservations, so if there’s even just one room left, it will be yours. Having a vacation club membership will help give you the flexibility to travel when you want and it also helps to ensure that you get the best deals possible. The reason for this is because they want you to travel you, so when you can travel they will always do their best to accommodate you. 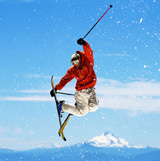 In fact, a lot of the hosts actually set aside special availability for these types of vacation promotions. Looking at it from the hosting property’s perspective, in order for these promotions to work you have to actually go when you have the time to go, even if it’s a surprise weekend off, and if you don’t go it’s a wasted discount and the room just sits empty. Also, if you don’t go how can you possibly rave about what a great deal you got to all your friends and family members? Having a timeshare or vacation club membership, will give you access to many different resorts and hotels and even bigger units that are reserved for members only. These luxurious accommodations usually come with the works, like a full kitchen complete with dining room and all pots, pans, utensils and dishes, multiple rooms, private balconies, granite counter tops, etc. Having access to more unit types and variations means that you will always be provided with comfortable and top-notch rooms at deluxe resorts and hotels. Sometimes resorts will even give you a complimentary upgrade to entice you to check out their property and give them a chance to tell you all about the benefits of possibly joining their program or club. Even if you’re not ready to commit, it’s still nice to enjoy the luxury without the huge price tag. Most of the popular resorts and hotels that offer timeshare and vacation club memberships are located in the more exciting and touristy areas with attractions and venues, like Orlando, Daytona Beach, Vegas, etc. With that being said, a lot of them include extra incentives, like attraction passes to a popular theme park or dinner show and sometimes even cash, to encourage you to come and preview what they have to offer. Whether you’re in the market for a timeshare or travel club or not, it’s clear to see that this could offer even more potential savings on getaways and big vacation alike. Dinner shows can run from anywhere between $70-$100 for just one adult, and having 2 passes come along, can save up to $140 and will include not only a fun night of entertainment, but also a chance to make magical memories and take lots of photos, and a free dinner. There is no obligation to purchase anything and you will get the promised freebie just for completing the tour regardless of if you sign up with them or not. Also, even if tickets are not included, most hotels and resorts offer passes, sometimes even discounted, at the concierge desk. If you are looking for some entertainment, too, some of our Orlando packages do include various passes, along with extremely discounted luxury accommodations. You may not be considering purchasing into any type or club or program right now, in fact, you may dead set against it, but if you’re at least okay with spending just 2 hours of your time listening about it and previewing the property, you’re in. That is really all the ask for and expect on these promotions anyway and you get to shave hundreds of dollars off your holiday expenditures. If you are in the market, perhaps considering getting your feet wet, this is a great way to get a good sample of what to expect. Taking advantage of a timeshare or vacation club promo, getting a huge discount on a stay for a few days and maybe even a couple of passes really give you a chance to see what it would be like to be a member of club or program. Stay in luxurious hotels and vacation like a VIP for pennies on the dollar. If you do travel frequently and could see yourself having the chance to travel to the locations they can offer, it may end up being a good monetary investment for you, if not, that’s alright, too. Just make sure you have a great time and tell everyone you know about it! Ok, I’m Interested, Let Me In! At this point you may be wondering: How do I get in on these getaway deals from these luxury resorts? Well, look no further than StayPromo.com . You can get hotels up to 80% off here and some even include attraction passes with your resort preview and stay. Listed below are some helpful links for some great hotels and resorts, as well as some discount vacation packages with the discount deals already applied for maximum savings. All promotions on the site, starting as low as $59, are good for up to 4 people, and the promo rates shown are total, for the entire 3 night stay, not per night or per person. If you have any questions about the featured deals please call 1 (888) 407-3849 (Monday-Friday 9AM-4PM EST) or email us at info@staypromo.com . We hope you get to take advantage of the savings while they’re still available, and if you do find one that you’d like to purchase, whether it’s Orlando or Myrtle Beach or New Smyrna Beach, we definitely hope you enjoy and have a great time. Also, every deal can be bought open-dated for 12 months, so if you know for sure that you do want to go to one of the locations on the site, but you’re unsure of the exact date, you can still secure the huge savings and then book it whenever you’re ready. Read more about our current promo locations below and click on the location you’re interested in traveling to and see the vacation discounts. Starting at just $59 for 3 nights, you’ll find some of the best online travel and timeshare presentation deals available on StayPromo.com! 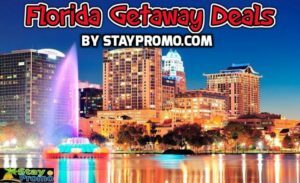 Whether you are looking for a fun-filled, action packed family vacation to the theme parks or a short trip to the beach you’ll find some of the best online travel deals to Florida here. Florida offers something for everyone. Nature lovers can enjoy popular attractions, like Gatorland or Animal Kingdom, thrifty shoppers will be able to take advantage at the outlet malls, and if you’re looking for a fantastic food adventure, there’s always Epcot or Universal’s CityWalk. For families looking to go on a Florida Beach vacation, Daytona is always a great choice! Relax in the sun, visit the Angell and Phelps Chocolate Factory, or lounge by the ocean. The possibilities are endless! If you want to travel with the kids or make it a romantic retreat, you are going to have a great time, especially if you save 80% off your stay! With perfect weather pretty much all year, Florida is always a good place to go, especially if you’re being bombarded by cold weather and snow storms. If you’re looking for a calm stay and maybe want to take in some historical sights, Charleston, SC is the place to be. It’s a charming sleepy town with horse-drawn carriages and lots of museums. Charleston has become one of the most popular travel destinations along the east coast over the past few years and it’s no wonder why. There’s no shortage of Southern hospitality here. If this sounds like your type of vacation, you’re bound to enjoy tranquil Stay Promos to Charleston, SC. Of course, if you’d prefer to stay closer to the beach, Myrtle Beach is always a great option, too! They offer dolphin tours and, for seafood lovers, Myrtle Beach has even been dubbed the “Seafood Capital of South Carolina”. The Grand Strand is awaiting your visit! Enjoy a stroll along Ocean Blvd., visit the pier, or just lounge by the beach and relax. Isn’t that what a vacation is for? 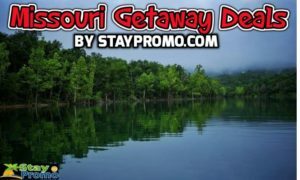 If you’re looking for a nice trip to the mid-west, Branson would be perfect! Surrounded by the beauty of nature (mountains and wildlife galore), but not too far out of the way that you can’t find some great entertainment. Enjoy dinner at Dolly Parton’s Dixie Stampede or spend the day at Silver Dollar City, the theme park that’ll transport you back into the 1800s. If you’re looking for a relaxing spot to spend the day outside, Table Rock Lake and Moonshine Beach are good choices. Offering paddle boats, fishing, surrounded by tranquility of nature, there’s something here for every member of the party so you’ll be able to make everyone happy here!